Even before Father A D Wagner was ordained, his father built a chapel of ease to the parish church for him, with the intention of bringing religion to the poor, particularly the fishermen who lived near the shore. It became parochial in 1873. The architect was R C Carpenter (Eccl April 1847 p154) and it was built between 1846 and 1848, when the future Cardinal Manning, then Archdeacon of Chichester, preached the first sermon (Sawyer II p219). It was built on the site of a dissenting chapel (ibid p216) and A D Wagner followed the preferences of the Ecclesiologists to the full. Unlike many Brighton churches, even later ones, it was properly oriented, so access from the street which runs to the east was either down a covered way along the outside of the south wall to the west end or on ceremonial occasions through the base of the tower at the east end. Ironically, the church did not achieve Wagner’s objects as it soon became fashionable amongst visitors like Gladstone, who worshipped here when in Brighton (2 p125). Wagner’s ritualist sympathies were in evidence from the start and aroused much opposition. William Whyte (p31) cites one critic, William Horsell (writing as ‘Adam Bede’) who in 1859 published The Natural History of Puseyism; with a Short Account of the Sunday Opera at St Paul’s Brighton. By 1875 £21,000 had been spent, all except £500 from private donations (PP 125) (mostly by the Wagners). Carpenter designed St Paul’s in the preferred ‘Middle Pointed’ style, with geometric tracery (seven lights of it in the east window) and fine detail like the double doorway in the base of the tower. This probably owes its position to a wish to make a full impact when the church was viewed from the street and initially only the base was built. The plan consists of an aisled nave with a long chancel and walls of dark flint, which contrasts with the light stonework. 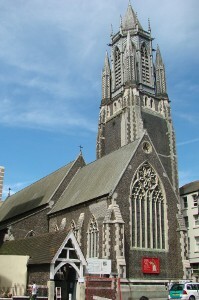 Though a great advance on any gothic church in Brighton at the time, St Paul’s is unmistakably a product of the 1840s. Even The Ecclesiologist (ibid), whilst approving for the most part, criticised the thin piers of the arcades, which are of quatrefoil section. Perhaps most characteristic of the date is the steeply pitched nave roof with arch-braces. The timbers are almost black and combined with the lack of a clerestory make the nave dark on such an enclosed site. 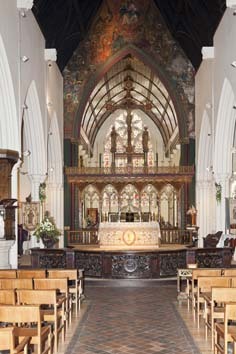 Nevertheless, the church is spacious, with a taller chancel arch resembling the arcades, with foliage capitals. This has been painted as part of the later decorative scheme (see below). Otherwise the interior is plain with small shafts for the rere-arches of the west and chancel windows only. Though Wagner’s projects for improving the condition of the poor found more success elsewhere in the town, he remained at St Paul’s for the rest of his life. The fittings and glass (see below) that were installed at the time of completion or shortly afterwards are some of the finest of their date in England and others have been added since, both during Wagner’s lifetime and later. Among the improvements and alterations he made in later years, were G F Bodley‘s replanned entrance (1 p19) of c1874, replacing Carpenter’s west lobby by a narthex. Bodley worshipped here and was churchwarden, but the completion of the tower and spire in 1876 was entrusted to R H Carpenter (B 31 p593), perhaps as he was the son of the original architect. R C Carpenter’s design (reproduced in 2) was for a taller tower with big bell-openings and a stone broach spire; a photograph of the 1860s (reproduced in Hedley p108) shows this had been built as far as what is now the base of the wooden lantern with a clumsy steep pitched temporary roof. Presumably it had originally been left in this state for reasons of cost, but alarmed by the collapse of the spire of Chichester cathedral in 1861, Wagner became concerned that the weight of a stone spire might be excessive (Dale p92). Hence, a wooden octagonal lantern, with tall traceried openings, lower turrets in the angles and a pointed top, was substituted and completed in 1873. In addition, Somers Clarke junior mentioned the addition of dormers to the nave (now gone) to improve the lighting (AR 44 p109). Though he gives no details, he may have been responsible for this. Little changed until the 1950s and 1960s, when J L Denman, whose grandfather had been foreman of the original builders, G Cheesman and Co (BAL/MSS DeJ/9/24) (on this occasion they mercifully did not design the church), altered the passage from the street and repaired the octagon, removing the decayed gargoyles. He also treated some of the glass appallingly (see below). Though a skilled restorer of mediaeval churches, Denman’s work here had little to commend it. Later work has been more perceptive. The glass has been restored as far as possible and the octagon, in a dangerous condition after being battered by gales for over a century, was renovated by R D Wood in 1996 (CBg 43 p33). In addition to making the structure sound, he reinstated the gargoyles and other detail removed by Denman. Altar rails: Thought to be French work of c1700 (BE(E) p166) and brought here in 1978 from a church in Edinburgh. They are incorporated in a new nave altar in front of the screen by N T Davey (I p19). Font: Plain, and octagonal, with a small carved and painted relief of the Baptism of Christ on one side. Font cover: Tall with crockets and pinnacles by R C Carpenter. 1. 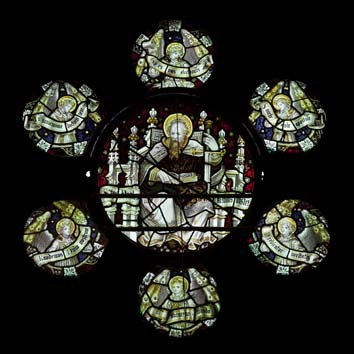 Starting in 1849, an almost complete set of glass was designed by A W N Pugin and made by J Hardman and Co. Most windows show standing figures, surrounded by canopies and other decorative glass (for details see 1 pp29-42). 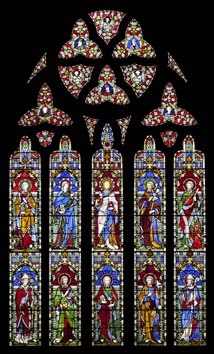 The last windows were installed in 1853 after Pugin’s death and were completed in part at least by his pupil J H Powell. He was responsible also in part at least for the design (Shepherd p184). However, the intense colours did not appeal to later Victorians. When Bodley was churchwarden the east and west windows were darkened with varnish and in 1952 J L Denman subjected the west one to the curiously named process of ‘pickling’, resetting the figures in plain glass and discarding the rest. In 1990-92 the varnish was removed and the background of the west window reinstated by M Lawrence. A contemporary sketch revealed its original lay-out and gave clues to the colouring, but there was insufficient detail to show precisely what it was like, so the present glass is best described as an informed and imaginative recreation of the form and colours of Pugin’s work. As such it is a triumph. 2. (Narthex west all) Eight small lights by C E Kempe, 1888-90. 3. 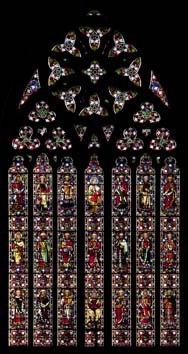 (South aisle, fourth window) Designed by A Bell before he became a partner in Clayton and Bell and made by Lavers, c1855 (1 p43). Glass doors: (From narthex to church) M Howse, 2011 showing St Paul and fish in nets (Artist’s website). Lectern: J H Powell for J Hardman and Co, 1885 (1 p20). Brass, large and impressive, with tiers of angels. 1. (North chancel) Father Wagner (d1902) by G F Bodley (ibid). Gilded alabaster relief of the Crucifixion, under which Wagner kneels. 2. (South aisle) W B Reynolds (d1935) and his wife, designed by himself (DNB). It is in the form of a brass with enamel inlay and is hard to discern (it is best seen in reproduction on the cover of 1). 1. 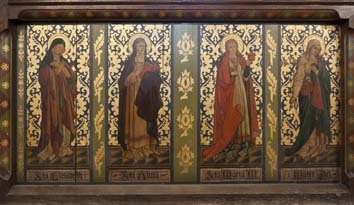 (Former reredos) In 1861 Bodley commissioned an altarpiece of the Adoration of the Magi and the Annunciation from Sir E Burne-Jones (For details see M Harrison in Parry (ed) pp107 and 119). This was considered too elaborate and Bodley bought it himself (it is now in the Tate Gallery). A second, simpler version was sold in 1994 (VSA 1993 p58) after being on loan to Brighton Art Gallery for many years and the proceeds largely financed the repairs to the octagon. 2. (Wall paintings and decoration) There was originally more. The chief survival is the Christ in Majesty above and around the chancel arch, by D Bell, c1865. The work has also been dated to c1880 with G Parlby as the executant artist (Antram and Morrice p100). 3. (North aisle altar) Early C16 Flemish panel of the Deposition. 4. 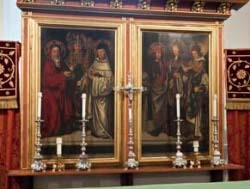 (South aisle altar) Early C16 panels showing six saints, probably painted in Cologne. Pulpit: Though quite small this was designed as part of the original fittings by R C Carpenter on a stone base with painted, traceried sides. Denman designed the tester in 1960 (BAL/MSS ibid) and unlike much of his work at that time fits in well with pierced cresting. 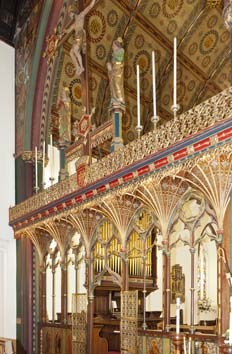 Screen: Painted and gilded and originally by R C Carpenter. Bodley added a crested top and rood about 1863 and the figures by H C Ingram (AR 44 p27) date from 1910.